Blend Taq® and Blend Taq® -Plus- are highly efficient Taq-based DNA polymerases developed based on the Barns' method(1). This method uses a DNA polymerase which lacked 3'→5' exonuclease (proofreading) activity (e.g., Taq DNA polymerase) and a small amount of an archaeal DNA polymerase with proofreading activity. Because the proofreading activity repairs misincorporated nucleotide bases causing the termination of the polymerase reaction, PCR with a 'mixed' enzyme solution enables highly efficient amplification. The enzyme solution of Blend Taq® -Plus- contains anti-Taq DNA polymerase antibodies that inhibit polymerase activity, allowing for Hot Start PCR. Blend Taq® and Blend Taq® -Plus- generate dA overhang-ended PCR products. Therefore, the PCR products can be cloned using a standard TA-cloning method. Effective for the amplification of various targets from small starting template amounts. 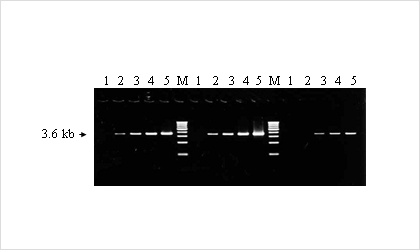 The PCR error ratio of this enzyme is approximately 3-4 times less than that of Taq DNA polymerase. *This enzyme solution contains anti-Taq DNA polymerase antibodies. *For colony-direct PCR, the pre-denaturation step should be set for 4 min. **Extension time should be set at 1min per 1 kb of target length. The PCR performances of Blend Taq® and Blend Taq® -Plus- were evaluated by amplification of long targets. 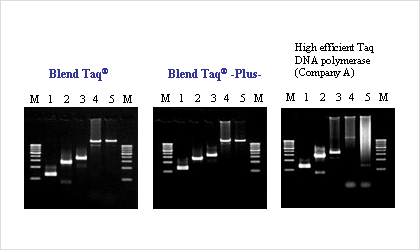 Blend Taq® and Blend Taq® -Plus- showed distinct bands whereas PCR enzymes from other companies showed poor bands or smears. No non-specific band was detected by Blend Taq® -Plus-. The sensitivities of Blend Taq® and Blend Taq® -Plus- were compared with those of other companies' high efficient Taq DNA polymerases. Blend Taq® and Blend Taq® -Plus- showed greater sensitivities than enzymes from other companies. The sensitivity of Blend Taq® -Plus- was slightly greater than that of Blend Taq®.